Nobel Prize-winning economist Amartya Sen will speak at Emory on Sunday, May 8, the day before receiving an honorary degree during the University's 171st Commencement. Photo by Stephanie Mitchell/Harvard Staff Photographer. 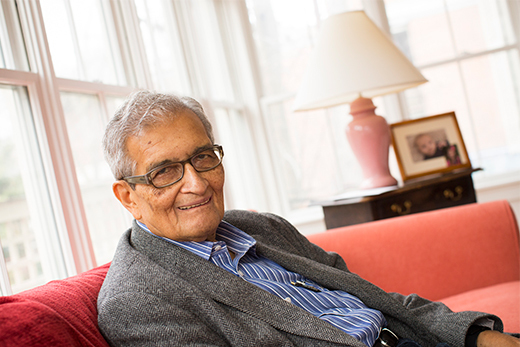 Nobel Prize-winning economist Amartya Sen, the Thomas W. Lamont University Professor of Economics and Philosophy at Harvard University and 2016 Emory University honorary degree recipient, will deliver a lecture on global security at 4 p.m. on Sunday, May 8, in White Hall, Room 208, on campus. Titled "Global Security and World Civilization," the lecture is free, but registration is requested by e-mailing Stephanie Gray at sjgray@emory.edu. Sen was awarded the Nobel Prize in Economic Sciences in 1998 in recognition of his groundbreaking research into welfare economics and the understanding of how economic policies affect nations and communities. He is in Atlanta to receive an honorary degree at Emory's 171st commencement exercises on Monday, May 9. Sen's talk is the inaugural event in the Milton and Virginia Kafoglis Economics Nobel Laureate Lecture Series, sponsored by the University's Department of Economics. The series is named for the late Milton Kafoglis, a former chair of the economics department, and his wife, Virginia. Kafoglis held the George Woodruff Professorship until his retirement in 1998 and worked in the areas of welfare economics, regulation, social choice, public finance and managerial economics. He died in 2014.